Begun in 1994, The Atlanta Study is the first comprehensive investigation of its kind into near-death experiences (NDEs). The study's name hardly captures what lies behind it: life-and-death dramas played out in operating rooms and hospital beds - and simultaneous events unseen by medical personnel but reported with astonishing clarity and conviction by nearly 50 individuals who returned from death's door.Now the founder of The Atlanta Study, Dr. Michael Sabom, shares his findings. A leading authority with over twenty years in the field of NDEs, Dr. Sabom reveals their impact on the people who have experienced them. From both medical and personal perspectives, he shares the electrifying stories of men and women from all walks of life and religious persuasions. He explores the clinical effect of the NDE on survival and healing and discloses surprising findings. He questions some common conclusions about NDEs. And he scrutinizes near-death experiences in the light of what the Bible has to say about death and dying, the realities of light and darkness, and the Gospel of Jesus Christ. 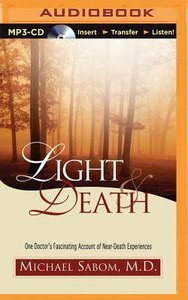 About "Light & Death (Unabridged, Mp3)"
Michael Sabom is a cardiologist in private practice and on staff at Northside and Saint Joseph's Hospitals in Atlanta, GA. His first book, Recollections of Death: A Medical Investigation, is considered to be a landmark in the field of near-death research. He has been featured on ABC's 20-20, NBC's Dateline, CBS's 48 Hours, CNN-TV, and in Focus on the Family's Physician magazine and major newspapers nationwide.